Includes a 2019 S Native American Dollar, Kennedy Half Dollar & Lowell NHP ATB Quarter NGC PF70 Ultra Cameo First Day Issue. Also includes a Lincoln Cent NGC MS67 RED FDI, Jefferson Nickel NGC MS67 FDI, & a Roosevelt Dime NGC MS67 Proof Like FDI. A special bonus of a (2019) One Cent Blank Planchet NGC Brilliant Uncirculated First Day Issue. These seven certified options will arrive in a NGC storage box. 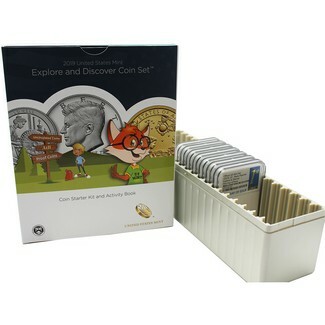 Also included will be the empty Original Packaging from the US MINT that has a Coin Starter Kit and Activity Book.